Wake Forest Innovation Quarter…Here We Come! Since Uneo’s inception, we have had offices downtown. 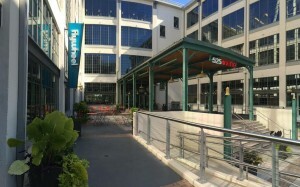 For the past five years we have enjoyed an awesome space on West Fourth Street which continues to be one of the most energizing areas in downtown Winston-Salem. We believe in, and want to continue to participate in, the continuing transformation of our beloved city. To that end, we have now moved our offices to Flywheel, a 24/7 co-working innovation space in the 525@Vine Building in the heart of the Wake Forest Innovation Quarter. We believe this innovative new co-working space will allow us to better connect with other folks who are passionate about what they do and who believe in the value of collaboration and partnership. This new location will also provide our current clients with a great place in which we can continue to push forward together. Hope to see you soon at 525 Vine Street, Suite 210, Winston-Salem, NC 27101! 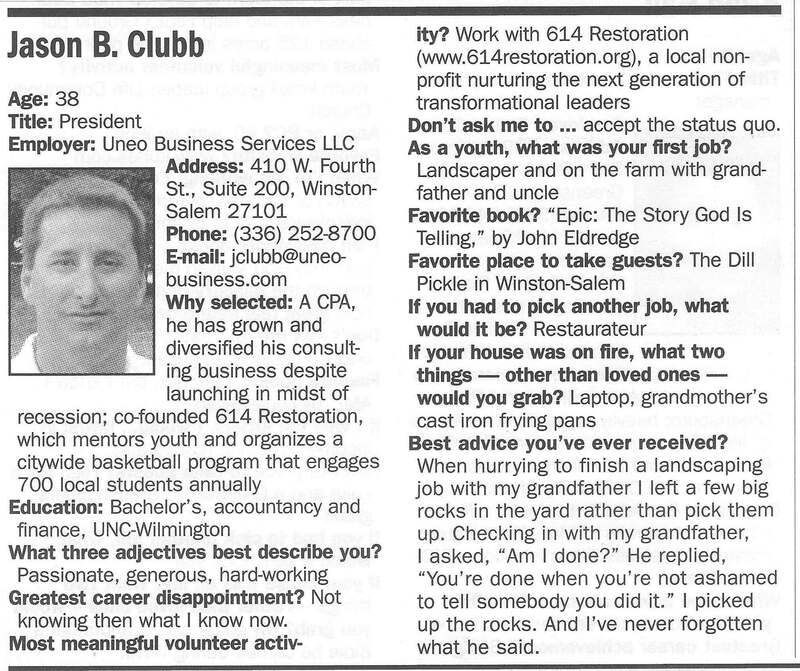 You can see more of Jason’s responses to The Business Journal’s questions below. These were not included in the publication due to space limitations. Greatest career achievement? Building long-lasting relationships with people from all walks of life and all parts of our city/community—relationships that have survived and thrived long after the end of a particular job or project. Greatest career disappointment? Not knowing then what I know now. Most meaningful volunteer activity? My work with 614 Restoration (www.614restoration.org), a local non-profit organization that I co-founded. I particularly enjoy working with students one-on-one or through our 4Real initiative, inspiring and equipping them to be the next generation of transformational leaders. I also enjoy leading the Hoops4Him (www.hoops4him.org) citywide youth basketball program, another 614 Restoration initiative that I have led for the past 15 years that reaches over 700 students each year. As a youth, what was your first job? Worked as a landscaper and on the farm with my grandfather and uncle. If I won the lottery, I would buy…some property I’ve had a vision for in Southside Winston-Salem and develop it. Where is your favorite place to take out-of-town guests? The Dill Pickle at the corner of Cherry Street and 4th Street in Winston-Salem – best chicken sandwich in town! If you had to pick another job or career, what would it be? Own and operate a restaurant. If your house caught on fire, what two things — other than loved ones — would you grab? My laptop computer and my grandmother’s cast iron frying pans. Best advice you’ve ever received? When hurrying to finish a landscaping job with my grandfather I inconspicuously left a few big rocks in the yard rather than pick them up. Checking in with my grandfather I asked, “Am I done?”. He replied, “You’re done when you’re not ashamed to tell somebody you did it.” I picked up the rocks. And I’ve never forgotten what he said. Lesson learned the hard way: God really does want us to rest from our labors. What could this region do to retain more young professionals? Speaking particularly about Winston-Salem—continue to develop downtown as a place to live, work, play, and shop. We’re on the right path, but lots more to do. Who would make the guest list at your dream dinner party? There are so many amazing people, dead and alive, with whom I would love to have a conversation—too many to even begin to make a list. What is the Triad’s greatest challenge? Developing a true sense of community that transcends perceived barriers of race, ethnicity, socio-economic status, and geography—a community that supports, encourages, and empowers the family; a community that celebrates personal and corporate generosity over self-indulgence and exorbitant profits; a community that acknowledges past successes and failures but is focused on the next generation. What is the Triad’s greatest selling point? Small town feel with some large city amenities…and only a few hours from the mountains or coast! I love living here! We are excited to announce that we have moved our offices from South Marshall Street to the center of downtown. You can now find us at 410 West Fourth Street, Suite 200, Winston-Salem, NC 27101. Our mailing address stays the same – PO Box 20458, Winston-Salem, NC 27120-0458. Give us a call sometime and let’s discuss how we might help ‘harmonize’ your business…maybe over a delicious marinated chicken sandwich at the Dill Pickle. Yum! 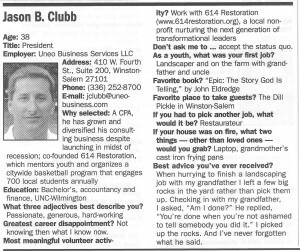 614 Restoration Non-profit organization co-founded by Uneo’s principal, Jason Clubb. 614 Restoration is committed to inspiring and equipping students to be the next generation of transformational leaders. Hoops4Him Initiative of 614 Restoration, a non-profit organization co-founded by Uneo’s principal, Jason Clubb. Hoops4Him is a citywide youth basketball league that reaches over 700 students each year.